ProBEAM® Flat Bezel LED Turn Signals include the ProBEAM® LED Dynamic Ringz™ Turn Signal Insert and ProBEAM® Flat Bezel Turn Signal Adapters for a sleek, custom finish to the incredibly bright ProBEAM® LED turn signal. ProBEAM® Flat Bezels are available with a Chrome or Gloss Black bezel combined with a DOT & SAE approved Smoked Lens. 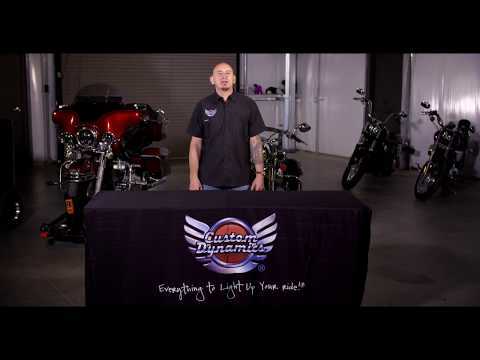 Backed by the Custom Dynamics® Lifetime LED Warranty. Sold as a Pair. Plug & Play on US Model 1986-2013 Electra Glide® Models, 1986-2019 Road King® models (Except Road King Special), 1986-2017 Heritage Softail®, 1999-2003 Road Glide® & 2005 Road Glide® Classic Harley-Davidson®s with Flat Style (2 screw) turn signal lenses and 1157 front dual contact bases (Does NOT Fit CVO™ Models). ProBEAM® Amber/White Dynamic Ringz™ also available as Bullet Style for fitment on models with Harley-Davidson® OEM bullet style turn signals and for CVO™ models. A variety of ProBEAM® Turn Signal Accessories also available to modify fitment or add a custom look to your bike.